Dru Lucia Roia has been a horse owner for over 34 years. She proudly cared for her first pony "Missy" for 31 years. The two grew up together trail riding and competing in everything from games to dressage to eventing. 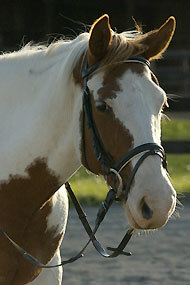 Missy later became a foundation school horse for Dru and Lucia Farm helping many others learn to love horses. Love of horses is still Ms. Roia's motivation and inspiration. After serving her country for 4 years in the United States Marine Corp, Ms. Roia attended Salem University in Salem, WV, where she graduated with her B.S. in Equestrian Education. She continued her dressage and eventing education in the prestigious and internationally known riding school at Morven Park in Leesburg, VA. After a two-year course at Westmoreland Davis International Equestrian Institute at Morven Park where she trained daily with Olympic Gold Medalist Tad Coffin and his former Coach Raul de Leon. Ms. Roia was invited to stay on to work as an associate instructor for two more years. Ms. Roia taught and rode daily at Westmoreland Davis until the closing of the school in 1989. From then on, Ms. Roia worked as a freelance riding instructor throughout the Northern Virginia area until opening Lucia Farm in February of 1997. In early 2006 Ms. Roia's primary focus of traditional riding and teaching of dressage, jumping, and eventing changed dramatically with her exposure to Natural Horsemanship using the Parelli method. This simple philosophy of horsemanship is to use horse psychology and the understanding of the horse's natural behaviors to train both students and horses to come together as partners. Since 2007, Ms. Roia has spend months training on campus at the Parelli centers and is now a Licensed Parelli Professional. She enjoys sharing her education and experience with her students and horses.